State-run telecommunications company Etecsa will install internet in some 2,000 homes in the capital's colonial district, Old Havana. The company has also reduced by 25% the fee charged to connect to the web, which most Cubans can only access from public wi-fi hotspots. Cuba has one of the lowest online connectivity rates in the world. Dissidents accuse the government of not providing affordable home internet access for political reasons. 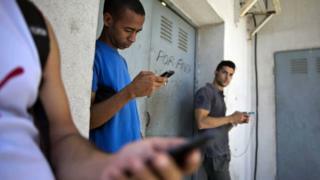 The Cuban government blames the US for the poor state of telecoms infrastructure, which it says is caused by the American economic embargo imposed in the 1960s. Details of the news scheme are scarce, but the authorities say the experiment will be extended if it is approved after the two-month trial period. Many Cubans hope the country's communist government will eventually expand the scheme, says the BBC's Will Grant in Havana. Last week, Etecsa signed an agreement with Google to provide faster access to content including Gmail and YouTube. Google will install local servers that will speed up connection to its services. Much of the island's internet infrastructure is obsolete. Google and Etecsa reached agreement in the final weeks of Barack Obama's presidency, but it is not clear whether his successor, Donald Trump, will change US policies towards Cuba.